08-29-2013: IndustriALL Global Union is celebrating the victory of its Turkish affiliate Teksif. The union led 12,000 workers on a nine-day strike from 15 August. The successful strike has achieved the workers’ demands. 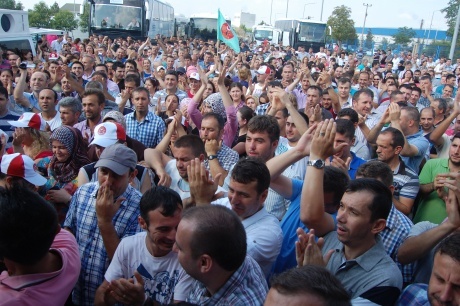 The Textile, Knitting and Clothing Industry Workers’ Union, Teksif, led the united strike from 15 August after sectorial level negotiations with the Turkish Textile Employers’ Federation failed. The previous agreement expired on 1 April 2013. Wage increase: It was agreed that wages will be increased with the following formula over the periods of six months: 2013/1 5%; 2013/2 3%; 2014/1 3%; 2014/4 4%; 2015/1 3%; 2015/2 4%. If inflation exceeds these percentages, wage increases will be complemented. Bonuses: The union’s demand for bonuses with an amount of 120-day salary per year was accepted by the employers. This represents an increase from the prior bonus equal to a 72-day salary period. For new employees, the bonus will be 96-day for the first year of employment while it is agreed to make it 108-day in the second and 120-day in the third. Overtime payments: It was agreed that overtime payments will be doubled (100% more) for work in weekdays, tripled (200% more) on weekends and four times (300% more) on bank holidays. If a worker is asked to work on a weekend, he or she will be given one extra holiday in the following week. Seniority Premium: According to the agreement, workers are entitled to a seniority premium amounting to 7 Turkish Liras on top of their hourly wages for each year of working up to a ten-year seniority. Sub-contracting: The parties agreed that there will be no subcontracting work at the workplaces. The Teksif President Nazmi Irgat thanked IndustriALL Global Union for its valuable support. 08-26-13: ITUC and IndustriALL meet with Mexican President Enrique Peña Nieto, who agrees to dialogue and says his government will not persecute independent unions. A joint delegation of the ITUC, TUCA and IndustriALL Global Union including the USW met on 23 August 2013 with President Enrique Peña Nieto and Labour Secretary Alfonso Navarrete Prida at the Los Pinos Presidential Palace in Mexico City. With a newly elected Mexican President and Mexico’s visible international role, the global unions had asked for a meeting to discuss the multiple labour rights problems including protection contracts, labour law reform, the non-functioning OECD National Contact Point issues, resolutions of specific conflicts, and G-20 issues. The President and Labour Secretary affirmed that this government has no intention to persecute independent unions and there is a commitment to pursue resolution to existing conflicts. In particular they recognized the legitimate leadership of Napoleón Gómez Urrutia of the mine and metalworkers’ union Los Mineros. Negotiations are continuing with the Mexican electrical workers’ union SME on finding solutions for the remaining 16.000 workers after the closure of the Luz y Fuerza del Centro company in 2009. The government recognized that protection contracts exist, but it does not see them as a legitimate instrument within the law. There is a commitment to continue a dialogue to look for a solution, and take steps regarding the ratification of ILO Convention 98. Global unions have been united in opposing protection contracts to guarantee freedom of association and collective bargaining. In many Mexican workplaces employers sign contracts with unions that the workers do not know about and have no ability to participate in. The government said it would look at dialogue with the unions in line with the ILO’s recommendations in the complaint 2694. The government agreed to consult with the ILO Director General regarding a technical review of last year’s labour law reform. The reform made some progress but fell short in the areas of union democracy and transparency. The Mexican government gave a detailed understanding of the problem of the informal sector and the need to formalize work. They reiterated their commitment to implement universal social protection. Members of the international delegation (for the full mission report, see here) will follow up with the Mexicans unions to ensure progress in the different areas on these issues. August 29, 2013: October 7 is fast approaching and already many IndustriALL Global Union affiliates are preparing to take action in support of the global IndustriALL campaign to STOP Precarious Work. Affiliates are urged to send information to press@industriall-union.org about their planned actions, as well as photos and report of the action once it has taken place. This information will be posted on the special campaign section of the IndustriALL website. “IndustriALL’s STOP Precarious Work campaign is not only about an annual action day, but about a mainstreamed strategic goal. 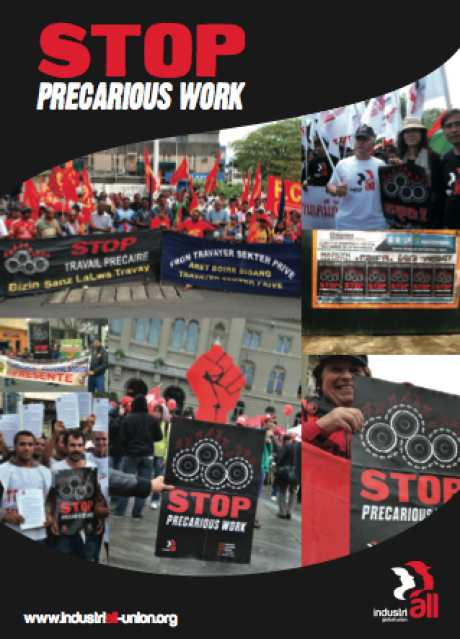 The issue of precarious work continues to be a standing item on the agenda of all IndustriALL meetings. Many company networks are undertaking mapping of the incidence of precarious work in their companies and formulating joint strategies to reduce it. New improved language is being introduced to GFAs. August 29, 2013: With deadlocks over wage demands in the mining, metal and textile sectors, thousands of workers prepare to take strike action next week, joining those already striking for higher wages, above the inflation rate of 5.6 per cent. More than 31 000 workers in the auto manufacturing sector downed tools on 19 August demanding a 14 per cent wage increase. The strike continues as National Union of Metalworkers of South Africa (Numsa) consults its members on a revised offer of 10 per cent from employers, up from 6 per cent. Getting ready to join their comrades on 2 September are about 72,000 Numsa members after a breakdown in wage negotiations with the Fuel Retailers Association and the Retail Motor Industry Organisation. Meanwhile, up to 90,000 members of the National Union of Mineworkers (NUM) are ready to respond to a strike call on the weekend after wage talks faltered in the gold sector. The NUM, which is the majority union in the sector, has given employers until 30 August to meet its demands for up to 60 per cent wage increase. The Chamber of Mines, negotiating on behalf of gold sector employers has put forward a final offer of between 6 and 6.5 per cent, which the NUM has rejected as this is only slightly above inflation. In the textile sector, the Southern African Clothing and Textile Workers Union (Sactwu) has conducted a strike ballot where workers have voted in favour of a strike should their wage dispute with employers not be settled. SACTWU is preparing to submit a 48 hour strike notice top employers on 2 September after which 50,000 of its members will take up strike action in support of their demands for a 7 per cent wage increase in metropolitan areas and 11 per cent for those in non-metro areas. August 29, 2013: The current dispute over the collective agreement at the Suez Steel plant has been resolved. But as the employer needs to fully recognize trade unions and workers’ rights, IndustriALL Global Union pushes for continued discussions. The signing of a collective agreement at the Suez Steel plant in February 2012 set off a series of disputes with dismissals, arrests and violence. In August 12 workers were dismissed and had police reports filed against them. Management refused to answer workers’ demands, saying they must return to work before negotiations could begin. In the last few weeks’ the conflict further escalated with the arrests of additional three workers’ leaders and gunmen and military sent in to scare workers at the plant back to production. The employer held a meeting, putting pressure on workers to convince their twelve colleagues and few more to leave. In an effort to ease the tense situation IndustriALL, together with Egyptian Democratic Labour Congress, EDLC, and the Egyptian Federation of Independent Trade Unions, EFITU, again pushed the Egyptian Minister of Manpower and Migration Kamal Abu Aita to take action to stop violence against the striking workers. The conflict was also raised with a number of ministers including the Minister of Industry. Last week, after the release of the detained workers and a negotiation process at the company facility in which the Governor of Suez participated, six workers agreed to leave after getting adequate financial remuneration. The remaining nine workers still want to be reinstated.